Review: French retroverts Unlimited Love are back with their 15th volume of rarities and underground goodies - all taken from the golden year of 1980. 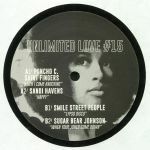 On the A side, we have Poncho C. Saint Fingers with his super soulful sleeper hit "When I Come Knocking", followed by Sandi Havens uplifting disco number "Happy". On the flip, you can save yourself at least a hundred bucks and enjoy Smile Street People's island dream that is "Lypso Disco" at a fraction of the cost that this diggers delight usually goes for. Same goes for Sugar Bear Johnson's low-slung jazz funk on "When Your Jones Come Down" which features the most awesome brass section ever.